Should develop into something very good. ...The Irresponsible Captain Tylor in the Wild Wild West, garnished with the New Testament. What do you get when you start out with a generous helping of Captain Tylor, mix in some originality and sprinkle on a dash of Ryo/Joe Saeba for flavour? 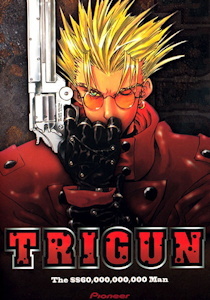 You get Vash the Stampede, the main character in Trigun, Pioneer's new release. Having said that I'm not really sure what to make of Trigun right now. Four episodes of this twenty six episode show us what I'm assuming is the basic foundations of the plot. You have wacky characters set in an alternative western world with a tad of modern and made-up technology (think Wild Wild West). There's many funny situations there that will most likely get a good laugh out of you. But that's about all so far. There is no real continuing story to speak of. Each episode had it's own story. A solid continuing story may develop but it may not. I'm leaning towards the former, since I feel these episodes were made to introduce us to the three main characters and let us get to know them a little bit. Right now, though, I really can't be sure. Based on what I've seen thus far, Trigun is pretty formulaic and the stories in these episodes won't surprise you. In fact, there's a good chance they may not even entertain you. Not to say the show is bad at all, it isn't. But I felt the plots of the episodes were fairly weak. The plots didn't have much range- they weren't occasionally serious, they were mostly there to make you laugh. That in and of itself isn't a bad thing. Comedic animes have made this approach before and it does work. But Trigun seemed to try and slip in some serious themes or plot twists and they just didn't seem to work all that well. It kind of seemed like they were trying to be something they weren't. Although that isn't to say the episodes were disappointing. On the contrary, I enjoyed them and had a pretty good time. It's just that the actual plots were disappointing. Trigun seems to rely more on wacky and funny situations and that's where it's well done. Taking some serious baddies and throwing some poor dork who is supposed to be someone they should fear and watching it play out from there is really great. The antics of Vash and the problems he created (not always intentionally) were certainly not repetitive and very funny. But I felt that relying solely on that and just throwing in a fairly shallow plot created an imbalance to Trigun and hampered it slightly. Another thing to note is Vash's similarities to Captain Tylor. In The Irresponsible Captain Tylor, we always wondered if Tylor was a genius, or just a lucky idiot. In Trigun we wonder if Vash is just a lucky idiot or the greatest gunman this world has ever known. In fact, we're never directly told if the Vash we've been following throughout these episodes is, indeed, the real Vash. It hints at it very obviously, but within these four episodes they never came right out and said it. We can only be pretty sure he is Vash, and that he is the greatest gunman ever. Unlike Tylor who we never figured out, Vash seems to be the real deal, but he does enough stupid things to throw the viewers opinion off from 100%. While this is going to bug some people, I'm looking forward to seeing how it will develop in later episodes. Another thing I liked about Trigun was the world it was set in. A Western style setting with a smidgen of modern technology mixed in makes for an interesting and original aspect that I haven't seen in anime until now. To go into more detail, every town has the classics; saloons with the swinging doors, houses built out of wood each beside each other and, of course, all set on dusty ground. To top it off, the extra characters are exactly what you'd expect from the western setting. But then you get some huge cyborg with a razor sharp boomerang-like weapon that can split any given building in half in the blink of an eye. A BFG that one of the insurance girls, Millie, carries around and looks like it came right from a Doom game. Plus, they throw in a few cars just for the heck of it. In the end, I like the end result and am looking forward to seeing more of the same in future volumes. Of course, with any comedy anime such as this you get some pretty wacky characters. The extras and more minor characters seem fine for a western world and fit right in. Then Vash comes to town and really stands out, both in his look and personality, and of course our two insurance agents come around looking for him. Millie is one of those wide-eyed naive but sweet girls who tots a, as mentioned above, BFG. And Meryl is like a more modern anime girl, with her slightly mean and nasty personality. Of course, these classic and modern characters don't mesh well, but that was obviously done on purpose and it was done well. Then there's Vash himself who is a real odd one. A complete goofball who is almost always smiling or has a funny SD look on his face yet becomes calm and serious in the face of adversity when it's required. I've already mentioned his similarities to Tylor, but he's also got a little Joe (or Ryo if you prefer) Saeba in him. You can't help but like Vash, even if he's a bit of a leach. Heck, he even tried to peek in on a pretty girl when he thought she was showering, via her window with the aid of a rope. All in all, Vash is a very entertaining character. Nobodies shown any depth yet, but I'm assuming it's pending as opposed to not being done at all. Trigun's actually a pretty well made TV series by anime standards. The art is generally very good as are the background. The western world is very well done and wouldn't have worked if it wasn't. The character designs while not very original (except for Vash) are attractive enough. The costumes also look good. The western clothes, even the simple ones on the minor or extra characters, look good. I liked the outfits Meryl and Millie wore too. But the real standout is Vash's outfit. His long red coat is completely out of place like he is (again, that's not a bad thing) but it does look really cool. The animation is actually above par. Generally smooth and the gunfights (both serious and comedic) look great. Or funny as the case may be. I can't really comment on the Japanese acting (yet), as I didn't listen to much of it, but the dub was actually well done. The main characters are all solidly acted and the casting is quite good. There are a lot of stereotypical western accents in the minor and extra characters that fit very well. But the real standout is Vash. A little on-the-fly audio switching will reveal that he and his Japanese voice sound almost if not exactly alike. As for his acting, it was very well done and the total wackiness of Vash was fully brought out. Even the scream was perfect. I dare say that there isn't any other dub voice actor who could portray Vash better. An interesting fact for some is that Vash's voice is done by Johnny Yong Borsh who used to be a Power Ranger (not one of the very original Rangers, but he was the Green Ranger way back when the show was still called, simply, Power Rangers). Unfortunately there are some poor performances by some of the minor and most of the extra characters. This will most likely affect your opinion of the acting a bit. The music is worth a special note. The opening/ending themes, plus a BGM were all done in a Western style music that fit the show perfectly. Although I do find the vocals on the ending theme to be a bit grating. Trigun is worth checking out and I do recommend it. However, I can only really base my review on the first four episodes, which is why the rating may be lower then you'd expect. I'm fairly confident that Trigun will develop into something very good, so my rating is very much subject to change. Trigun is Copyright © Nightow Yasuhiro / SHONEN GAHO-SHA - TOKUMA SHOTEN - JVC. Any images are the property of their respective rightsholders, and included for review purposes only under the fair-use clause of US copyright law.